North Harbour professional Michael Hendry has finished runner-up at the Queensland PGA Championship played at the City Golf Club in Toowoomba. The 33-year-old carded a two under par 66 in the final round to finish two shots back from Queenslander Brad Kennedy who won his state PGA title for the first time. Hendry was in a share of the lead with five holes to play before Kennedy made a birdie on the 14th to edge one ahead. The Kiwi matched that with a birdie at the par 3 17th before he bogeyed the 18th to allow the former NZ Open champion an easy finish. The highest ranked player in the field made a birdie at the last to claim victory by two shots on an 18-under par total 254. 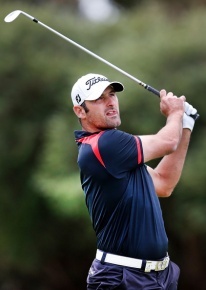 Hendry, who earned $13000 (NZD) for finishing runner-up, will now focus his attention on defending his NZ PGA Championship title at The Hills near Arrowtown in two weeks' time. Finishing in outright third on 14-under the card was New South Welshman Anthony Summers while the leading amateur Cameron Smith finished a shot further behind in outright fourth. Wellington professional Gareth Paddison carded a three under par 65 in the final round to finish in a share of fifth place on a 12-under par total 260 alongside Australians Ryan McCarthy, Scott Laycock, Rohan Blizard. Paddison made $5500 for his week in Queensland. The other Kiwis to make the cut were Brad Shilton and Pieter Zwart who finished tied 19th, Ryan Fox, who was tied 45th and Troy Ropiha finished in a share of 52nd place.